Sohail Sen cemented his place as a music director in 2011 (after 'What's Your Rashee'-2009 and 'Khelein Hum Jee Jaan Sey'-2010) with 'Mere Brother Ki Dulhan' which boasted of some good entertaining tracks although his 'Ek Tha Tiger' last year didn't fared at par with the expectations of the listeners ('Mashallah' was a guest composition by Sajid-Wajid and not by Sohail Sen) but still "Gunday" brings on much excitement on the musical front, sole reason being the coming together of the hit combination of Mere Brother Ki Dulhan; Ali Abbas Zafar (Director), Sohail Sen (Music Director) and Irshad Kamil (Lyricist), also the movie being an action-romantic thriller, some energetic tunes along with some romance is on the cards for sure. The expectations takes a high with ten compositions including few reprise versions and one instrumental, so without detailing any more facts and figures, lets fight it out..Ohh I mean let’s find it out!! Electric guitar riffs starts off the proceedings in style with "Jashn-e-Ishqa"..It's full of energy, be it the powerful renditions by Javed Ali and Shadab Faridi (whose voice reminds of Sharib-Toshi) or the rock flavoured arrangements, everything connects instantly. The song is about the celebration of brotherhood, friendship and love (about Vikram and Bala- two main leads in the movie) where Irshad Kamil makes sure that he provides an adrenaline rush with his lyrics and succeeds. Overall, it makes a terrific start to the soundtrack which will mark an entry straight into the top five very soon! Would have loved to hear a reprise version with Sukhwinder Singh but instead we have "Rhythm Of Jashn-e-Ishqa" which is more of a background score where Shadab Faridi narrates a line or two, although it's been arranged nicely but still it fails to make any impact! When artists like Bappi Lahiri, KK, Vishal Dadlani and Neeti Mohan joins in for a song, one doesn't really know what to expect from the composition.."Tune Maari Entriyaan" has Chartbuster written all over it right from the word Go and is very Desi at heart! Bappi Lahiri starts off this with Bengali renditions, twenty five seconds into the song and the terrific combination (overlapping) of Vishal Dadlani and K.K alongside the Tang Tang Tang Tang arrangements makes up for a fabulous entertaining romantic number about the protagonists (Ranveer Singh and Arjun Kapoor) being fallen in love with the female lead (Priyanka Chopra). Neeti Mohan makes one falls in love with her voice and makes sure that her sweet yet different renditions reminds of the 70's style and at the same time brings on an altogether different feel to this composition. The interlude is heavily arranged with electric guitar riffs, keyboard, drums and Dhol arrangements. Result: Super Hit! The movie being centralized in Calcutta, we have a reprise version "Tune Maari Entriyaan (Bangla Version)" where Bappi Lahiri and Monali Thakur takes centre stage and both does really well in maintaining the entertainment quotient, especially some Bangla narrations that have been included in the second interlude and at towards the end, the lyrics in this version are writeen by Bappi Lahiri and Gautam Susmit, however it would have been really interesting if there had been some innovations as far as the arrangements are concerned which are completely same as in the Hindi version. Still, this version provides variety from the usual remix fillers and Sohail Sen gets a thumps up for this! Arijit Singh, the name itself brings on huge expectations now-a-days.."Jiya", is a treat for the music lovers who wants their songs to grow and grow with repeated hearings, although it may sound haunting at first hear and one may associate a sad/heartbreak outing with it but it falls in an altogether different zone and is a musical delight, a separate genre from the usual mellifluous love songs that has been associated with Arijit Singh lately. This one is very beautifully arranged with variety of instruments being used and may very well become an instant favourite with the set of listeners that have a certain liking for THE A.R.Rahman territory! Irshad Kamil's words flow like poetry and are impressive. Verdict: Beautiful, don't miss this one! The combination of Neha Bhasin and Sohail Sen previously resulted in 'Dhunki' (Mere Brother Ki Dulhan); she combines with Bappi Lahiri for "Asalaam-e-Ishqum" which is ought to be a club number picturised on Priyanka Chopra. Neha Bhasin sings this one with passion but the average lyrics and arrangements makes this one a passable number that may gain some likeability once the video is unleashed; else it's to be enjoyed in the movie only! A sad number picturised on Arjun Kapoor.."Saaiyaan" is nicely arranged and starts off pretty well but the composition fails to hold the grip for the whole four minutes. Shahid Mallya sings this one with ease and makes one feels the pain but the song gets a tad bit repetitive with the use of word 'Saaiyaan' and the overall result is just average, however loved the treatment that the composer gave with the use of electric guitar alongside the classical sort of renditions from 3: 43 till end! "Mann Kunto Maula" , a devotional track that starts off on some beautiful high pitched classical notes/alaaps by Altamash Faridi and Shadab Faridi, but to much surprise after 1: 10 minutes, the song takes a complete U-Turn towards the rock genre with drums and guitar. Sohail Sen shows his love for the Guitar and it's a real treat for music lovers to hear a Qawwali alongside the amalgamation of Guitar, Tabla and Drums providing it a rock feel..Creativity at its best! Extraordinary composition! Rightly so, a classical version was on the cards with the same set of singers.."Mann Kunto Maula - Classical" which focuses more on the vocals with some extraordinary jugalbandi of Tabla and Harmonium has the power to leave the listeners in trance. The effort put in by both the talented singers deserves applause. This version is lyrically and musically heavy as compared with the rock version and I don't remember when I last heard such beautiful classical arrangements in a Bollywood soundtrack backed up by such pretentious, polished singing that too for a song that has a devotional tag attached to it. Speechless! 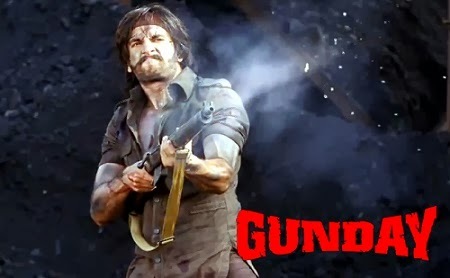 The title track "Gunday" ends the soundtrack on a crackling note where Sohail Sen takes centre stage for the vocals and lyrics and is super gorgeous. The English rap portions by Kinga Rhymes provides that extra western zing/feel although the song gives a déjà-vu feel of some Rahman song, probably from the movie Rang De Basanti but that's only for a few seconds from 1: 10 to 1: 22. Crackling! To conclude, Gunday has in it to be a chartbuster soundtrack with variety of genre/forte in each song. Sohail Sen makes sure that there is everything for each segment of listeners; 'Jashn-e-Ishqa' and 'Tune Maari Entriyaan' are Masala commercial entertainers where 'Jiya' will find its own set of listeners. 'Mann Kunto Maula'-Both Versions are certainly the highlight of the soundtrack and should reach the masses! This is one soundtrack which should find a place in the playlist of every listener!